That is why we, the newsroom of The Denver Post, are outraged at the unconscionable censorship imposed on our now-former editorial page editor, Chuck Plunkett. Chuck told the truth, eloquently and pointedly. And in that our newspaper’s corporate ownership — Digital First Media and the hedge fund Alden Global Capital — saw something to fear, not to champion. Chuck resigned Thursday after the chief operating officer of DFM, Guy Gilmore, blocked Chuck from publishing an editorial that forcefully criticized DFM and Alden. Chuck’s resignation followed the firing last month of the editorial page editor for our corporate sibling, the Boulder Daily Camera, who also spoke out against our owners. This censorship harms our readers, and we are concerned it also threatens the newsroom’s independence. It requires journalists to work in an unacceptable climate of intimidation, worried that telling the truth will lead to dismissal. For years, the companies have blamed journalists and the reading public for the steady decline in their newspapers’ quality. In Chuck’s banned editorial, you can read the facts: According to an independent report, Alden and DFM reaped $160 million in profits from their newspapers across the country in 2017, including $28 million from The Denver Post. In that time, the corporate owners — led by Alden bosses Heath Freeman and Randall Smith — slashed budgets and laid off reporters, editors, photographers, designers, producers, pressmen, advertising reps, customer service personnel and other members of the newspaper family. Journalism in those places withered, the powerful impact on community and accountability that newspapers provide did too, and only a handful of wealthy individuals benefited. Those are not the actions of owners who appear to care about journalism or about Colorado. Though Chuck’s province at the newspaper was opinion and we, the newsroom, operate with strict ethical rules for objectivity, we have always shared a common purpose. We tell the truth, even when it is difficult. We tell the truth, even when the subject hits close to home. 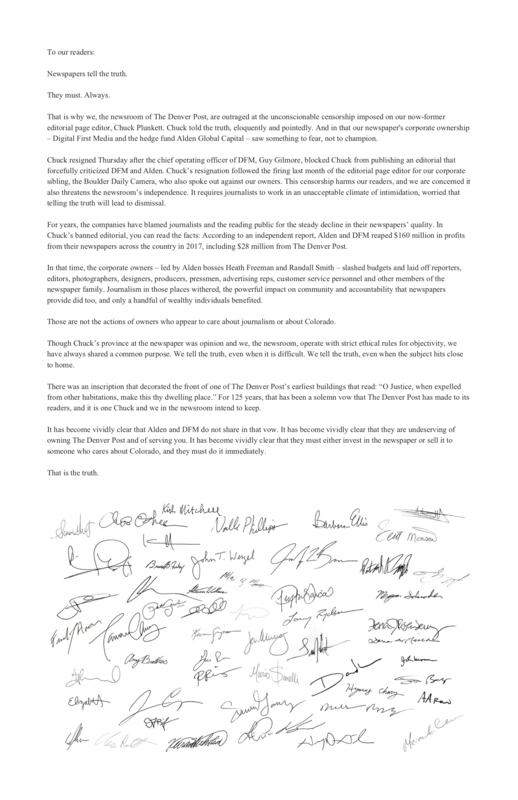 For 125 years, that has been a solemn vow that The Denver Post has made to its readers, and it is one Chuck and we in the newsroom intend to keep. It has become vividly clear that Alden and DFM do not share in that vow. It has become vividly clear that they are undeserving of owning The Denver Post and of serving you. It has become vividly clear that they must either invest in the newspaper or sell it to someone who cares about Colorado, and they must do it immediately. Maybe now is a good time to discuss your Cory Gardner endorsement? Stand up to them. Tell the truth. A free press is the foundation of democracy. Maybe it’s time to resurrect The Rocky Mountain News and have some competition again. Good luck! Stay strong! From a Canadian journalist. I retired from the Fort Worth Star-Telegram after 31 years and am heart broken over what is happening there. This is a true David and Goliath battle that must play out during this bizarre time of “alternative facts” and “fake news.” The time has come for truth telling with no holding back. The Denver Post staff has taken this battle on, leading the charge for the rest of the embattled newspapers around the country. This is not only about the heart and soul of a paper and city, this is about the heart and soul of our nation. Thank you for educating us on what a free and independent press truly looks like, and what it stands for. Please let us know what we can do to support you! As a retired journalist and former owner of a now defunct Colorado weekly (The Dolores Star), I am proud of your stance and wish you success in your battle. Without truth there can be no justice. We value our newspapers, and their position and tradition in Denver, and we value the journalists and staff who produce the paper. Stop the shrinkage. I love that this was put forward by the Guild and that you are all standing together to protect our Democracy. To make it easier for those who won’t take the time to writ a letter, could you post a simple petition for us to sign? Thank you for all that you do! As the daughter of a NYT reporter, I know you are overworked and underpaid, and how crucial your role is to our freedom. Good for the people who put honesty and truth above profits. No doubt there will be no problem finding new hires to fill empty slots. So few put allegience to their personal beliefs above willingness to accept pay checks. Only when it becomes unprofitable to own the paper will teh owners sell it. The most effective route to change may be to notify advertizers that as long as they support current owners, you will not partonize them. Stay strong and stay true to your mission. The demise of newspapers in Denver has been very sobering to me. I expected someone to save the Rocky and no one did. I couldn’t believe it went down. Now, the same situation with the Post. To me, this doesn’t say much about Denver and what it values as a community. We need a newspaper! Somehow this has to work out. There must be a way. I admire all of you so much. I was marveling the other day that in the midst of all the chaos, Bruce Finley was doing some of his most moving and beautiful writing. This is what we will lose and can’t believe that there seems to be so little concern! When newspapers go down, our lives are diminished, not only in the obvious way ot knowing less about what’s going on, but in having less poetry, beauty and sometimes welcome laughter, in our lives. It’s a Liberal newspaper trying to brainwash the readers of Denver. What you publish is not real facts it’s what you want Denver readers to believe. Your Journalist brought the paper to where it is!! As a former Postie, I applaud the courage of the staff and their ethical stance for journalism as a vital underpinning of democracy. Digital First and Alden are nothing but odious vulture capitalists sucking the life- blood out of our profession. Thanks for doing what you are doing here, this valorous thing. I absolutely believe as you do, and I know many who do. This is an essential leg supporting our most quintessential form of government in the free world. We Coloradans deserve the best possible world we can make for our selves, and this situation has been diminishing us all. It feels like neocolonialism. It takes courage to sign this letter. I would hope you folks would consider going out on strike and shut the paper down until these idiots come to their senses. Large corporate and venture capitalist ownership of media corrupts. Just shut it down. Truth MUST come before profits. You are a newspaper, for crying out loud! Shame on you. Vanishing along with freedom of the press is the purpose of government established by the nation’s Founders and defended and succinctly defined by Lincoln as government of the people, by the people and for the people. In service to the hoarders of the nation’s and world’s wealth it is to be totally back to the times of George III and his royally entitled few—King Trump and his rump. From Doylestown PA a shout out for your courage. I love and respect the Free Press and hope someone with deep pockets filled with justice will buy the Denver Post.